Where there’s art, there’s hope. I appreciate the year has well and truly started, but the haze cast by a hot and politically overheated summer continued far beyond its due by date. So it took me a while to drum up the energy to wander through a handful of Sydney’s galleries. Exhausted from heat and the proposition of ‘alternative facts’, I needed firstly, air-conditioning and secondly, a sign that all was not lost. Artspace was a great place to start. For the next couple of months, the galleries at Artspace have been transformed into a colour-charged, dynamic and playful environment. Superposition of Three Types is an exhibition which you don’t just observe, but find yourself immersed in. It’s is as refreshing as slipping into a cool pool. Superposition is a term in quantum theory which describes the possibility that matter exists in all forms at any given time, but it is only our focus on it which renders it in a particular state. For any further explanations of quantum theory, please ask Justin Trudeaux. The suggestion here is that colour abstraction is neither fixed nor definitive, and is the overarching starting point of (in this case) 13 different artists, working across a range of materials, scales, shapes and forms, at any given time. Whilst it’s not all about paint, it is all about colour. Rebecca Baumann’s Colour Scenario #3 sets the scene. Baumann draws the architecture of the building into the dynamics of the exhibition by painting all the walls of the gallery from top to bottom, in mismatched bright flat colours. It would do the work Colour Scenario #3 an injustice to regard it as an exercise in interior design. Baumann is not offering a muted palette here to highlight the artworks, but creates a coloured environment in which the other works quite comfortably jostle for attention. Installation view Superposition of Three Types, presented by Artspace. Brendan van Hek Field Works and Lara Merrett Time after Time (detail), with Rebecca Baumann Colour Scenario #3 (detail). The concept sits well with her ongoing interests into the complexities of human emotion and the pursuit of happiness, explored through an understanding of psychology, colour theory and art history. Baumann seeks to connect with her audience by experimenting with colour and the moods, ambiguities and memories it evokes. Collection: MCA, purchased with funds provided by the Coe and Mordant families, 2011. Originally commissioned by the ACCA for NEW11. 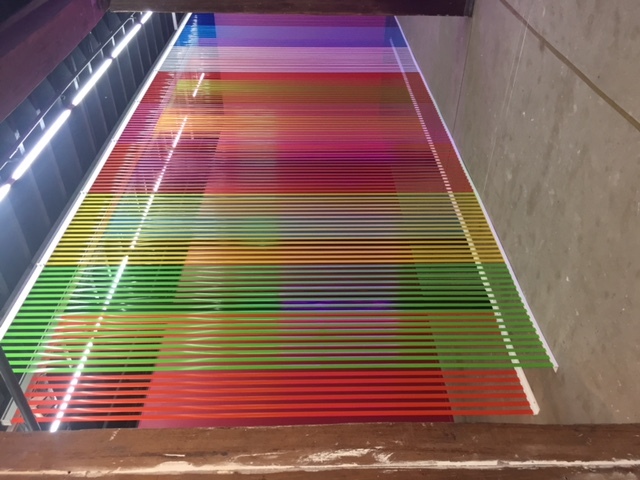 Rebecca Baumann Light Event 2015; dichroic film. Commissioned by Lawrence Wilson Art Gallery, Perth for Here & Now 15. Photo: Bo Wong. Image courtesy the artist and LWAG. Colour Scenario #3 sets a tone for the exhibition that is uplifting, welcoming, familiar and refreshing. Don’t worry about getting into the layers of art theory and history, if you love colour relish being immersed by it. Lara Merrett plays with her voluminous, voluptuous painted drop sheets, slouching down the walls onto the floor, forming themselves into seas of softened haphazard shapes – a lovely textural and spatial shift from her 2D work of acrylic and ink on linen. 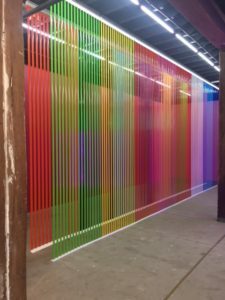 Nike Savvas ties multi-coloured plastic strips, akin to fly screen material, tautly to two parallel screens, which form a wall of colour sensation – vibrating, shimmering and bouncing of each other and the gallery wall behind it. Think optical illusions in 3D rather than painted 2D. More of Nike’s work can be found at Dominik Mersch’s gallery in Rushcutters Bay which is marking its 10th Anniversary with an exhibition of its represented artists, certainly something worth celebrating in a town where galleries continue to fade off the radar. Nike Savvas Rally 2014, plastic tape. Site specific installation commissioned with funds provided by the Art Gallery Society of NSW Contempo Group 2014. Julian Day also shows with Dominik Mersch. His contribution to Superposition is a sound work – an audio-guide of sorts. Do not expect the standard education-style explanation of each work. The discussions are overarching principles which are randomly offered in any order, standing in front of any of the works. Day takes a step back from focussing on an individual artist or work, instead offering snippets of music, quotes, observations and questions which prompt fresh ways of connecting with art. Julian Day is an artist, composer and arts commentator. He draws upon his training in both composition and visual art to create simple, yet evocative, works encompassing installation, video, sound, text and performance. Much of Day’s works are site-specific and collaborative, relying on dispersed sound to explore the acoustic, architectural and relational properties of varied spaces including galleries. “I try to shift the emphasis away from the objects that make the sound to what happens next.” He recently performed a 24-hour composition on pipe organ for MONA FOMA. The Weight of Air was literally about air, focussing less on the organ, despite its remarkable sculptural quality, and more on its ability to sculpt the room as an expansive chamber of air. Brendan van Hek speaks in colour neon: intense, discordant and obviously electrifying. Jonny Niesche’s colour is softer, tonal gradations on fabric. Both show with Sarah Cottier Gallery: Niesche’s first solo show coming up in April. I suggest making a diary note not to miss it. There’ll be queue to buy these. Ry David Bradley seduces you with colour printed on velvet. It’s subtle, subversive and sensuous. Let yourself go and touch it! Fingerprint marks on velvet are akin to fingers through paint on canvas. Just be reasonable and make sure you’ve washed off lunch before doing so. And, though it is a pretty dusty pink, the imagery, blurred and indistinct, harks back to the Italian Futurists and their obsession with heavy machinery. Bradley’s work though is distinctly 21stC. He sources images from the web, which he processes via computer editing technology and transfers to velvet. LoFi meets HiFi. The two works here are truly lovely. More of Bradley’s work can be seen at newcomer COMA Gallery in Ruschcutters Bay, where he has just finished a solo show. New gallerist Sotiris (Soti) Sotiriou’s approach is to introduce artists working overseas into the Sydney art consciousness. Soti’s is connected to a next gen group of artists, working across continents from his time in the US. There are some interesting artists – Tschabalala Self, John Pilkington and John Houck to name a few – who’ll definitely inject a new conversation into the scene. Drop by COMA to see artwork from outside the Sydney groove. You’ll be warmly welcomed and offered the cook’s tour of both exhibition and stockroom spaces. These are early days, but already local artists and some collectors are finding their way to this large, concrete shopfront. COMA Gallery, near the lights at McLachlan Ave and Bayswater Road, on the eastern side. Back to Artspace: as memorable and enjoyable for its total lack of colour, is the installation at the entrance: Contradictory Demands by Ciaran Begley, as part of the IDEAS Platform. This program is hosted in a small room at the entry to the venue. Once used for storage its has now been re-fitted as a flexible space for exhibitions, conversations, performances and lectures. It fits well with Artspace ethos of providing spaces in which artists can explore and experiment with ideas. Apparently if you have an idea, they have the platform for you to share it. Begley’s installation is made from plywood and piano-hinged origami-like constructions, and sits discretely against the existing plywood-clad walls of the dedicated IDEAS Platform room. His sculptural and functional forms come to life with public interaction, by pulling on the simple rope and pulley mechanisms to rearrange the plywood pieces into the predetermined shapes. The audience, one at a time, intuitively follows the mapped out ‘instructions’ presented by the artist to bring life to his work. On until 12 March. Ciaran Begley Counterbalance #4 2017 (detail), plywood, hinges & steel cable. Image courtesy the artist. During my visit, I found joy and moments of pure pleasure – a relief from the draining heat and political haranguing outside. Others did too: a mothers’ group with sweet babes in prams had relocated playgroup to Artspace and all were having a wonderful time; a young girl was playing with Begley’s installation, pulling on the ropes and wire unselfconsciously showing whoever was watching how to let loose and interact with it; and, different time/day, our own First Lady was wandering around, by herself and looking with interest. Maybe there is hope …. Superposition is on until 17 April. Interesting read – thanks Fiona! Those big powdery drop sheets of Lara’s were just gorgeous I thought.